The current bid is $1.25!! I'd better go after this one! Weren't these guys once Skull Customs? Their work is freaking unbelievable. How about Vintage Leia in Ree Yees Disguise? What do you mean you don't remember that scene? That is the funniest thing I've ever seen. They aren't the greatest figures inside, but I think that this looks pretty cool on a card. Yup. Very nice looking card. That is nice. Im not a MIP collector but this is one I'd put on my wall. Something like this in the store ( with better figs of course) would make a killing. that's actually not that bad. could use a Fritz or Chewie make over, but all in all not a bad idea. My only problem is the front--it's inaccurate! I think it has a great vintage prototype feel ala the At-At Ion Cannon. Yours looks way better though, with alot more detail. They didn't even have the decency to SAY that they STOLE this idea. BTW, just a quick question while were on the subject. Has anyone else ever seen one of their stolen ideas copied and put on ebay? Ive seen one of my JLU customs copied a couple of months back. 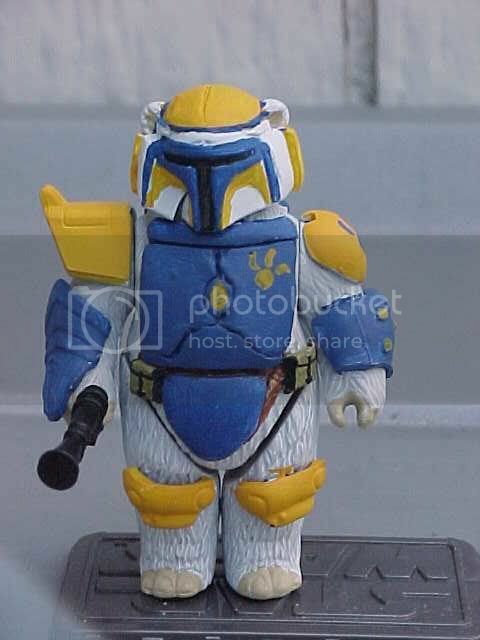 But never one of my posted SW customs. Personally I find this kind of thing to be offensive. Yup. Every clone on ebay was originally my idea. Anyway, Fritzkreig version is much better. I wonder who will get a higher closing bid. Here is something I've been wanting to do for a long time. Paint the included holograms that come with figures now a days. Imagine what someone that paints Warhammer 40k can do with these.